Lewis Hamilton is within touching distance of a fifth F1 world drivers’ title as the 2018 roadshow moves on to the Mexican Grand Prix this weekend. The British ace failed to clinch another crown when finishing only third in the United States Grand Prix in Austin, as Ferrari’s Kimi Raikkonen and Red Bull’s Max Verstappen kept him at bay. But Hamilton still leads Sebastian Vettel by a yawning 70 points after the Ferrari ace endured another frustrating day, finishing fourth following a first-lap collision with Daniel Ricciardo. 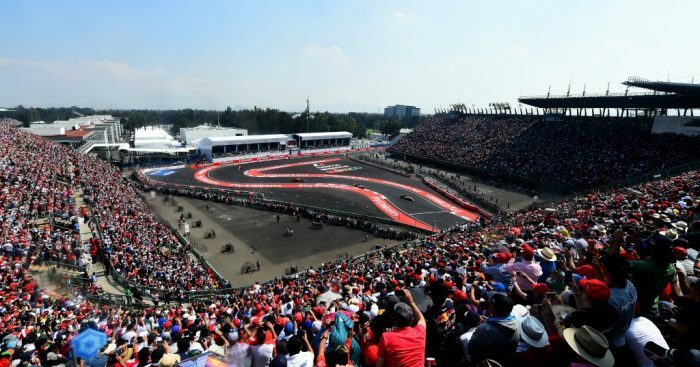 Here is a guide to all you need to now about the upcoming weekend at Autodromo Hermanos Rodriguez – including details of how to watch the race on TV, the latest betting odds and what Hamilton needs to do to win the title. What time does the Mexican Grand Prix start? NB: Mexican daylight saving comes into effect on Sunday – the same as the UK – so will not affect the start time for UK TV viewers. But it will affect the start time for US viewers, who should note the race begins at 1510 ET. Where does the Mexican Grand Prix take place? Revamped in recent years, Mexico City returns to the Formula 1 calendar in 2015, slotting in as the third last grand prix of the calendar. The circuit, which was first used for a non-Championship race back in 1962, comprises 16 corners of which the final corner – the peraltada – is the fastest of all. That leads onto a long start/finish straight that will make for a thrilling run to the first corner. The track is 4.309km long and Sunday’s race will be run over 71 laps. Where can I watch the Mexican Grand Prix on TV? Mexican Grand Prix weekend – including the race proper – will be screened live in the UK by pay-TV broadcaster Sky Sports on its dedicated Sky Sports F1 channel. Highlights will be aired by free-to-air broadcaster Channel 4. What is the weather forecast for the Mexican Grand Prix? Friday October 26: 22C, scattered thunderstorms. Saturday October 27: 21C, rain. Sunday October 28: 20C, chance of thunderstorms. Which drivers have won the Mexican Grand Prix? What are the odds for the Mexican Grand Prix? Max Verstappen is now favourite to win the Mexican Grand Prix according to major British bookmaker Bet365. World title scenarios – what does Lewis Hamilton need to clinch? F1 tyre manufacturer Pirelli will bring three compounds to Mexico City – the red supersoft tyre, the purple ultrasoft tyre and the pink hypsersoft tyre.